This lentil soup comes out so wonderfully - the flavors are nicely balanced and perfectly put together. We always try to follow this recipe exactly to the point - do not deviate from the proportions or you wont get as nice a result. Fry bacon pieces until crispy. Put in diced onion and carrot into the pot and cook with the bacon, press garlic and let it cook for a few minutes. Add tomatoes and lentils, cook 8-10 min on medium low heat. Add wine, bring to a simmer, add broth and water. Cook for 30 min on low heat, partially covered. 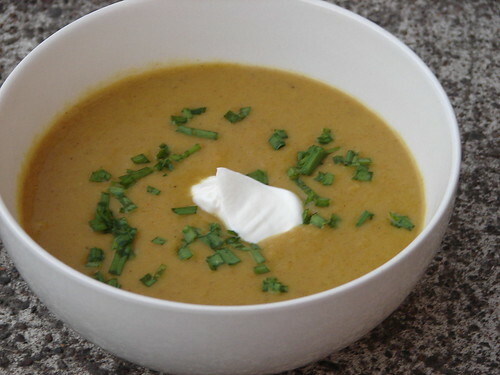 When soup is cooked nicely, puree 3 cups of soup in a blender and add 1 1/2 tsp balsamic vinegar. Salt and pepper if needed, add fresh parsley and serve with a dollop of sour cream. Name: jorame | Comment: This lentil soup is the best I ever made. I followed the recipe exactly using French lentils and white wine. The second time I had some red wine already open so used that and the finished result was equally delicious. Usually I mess with a recipe a bit, it's just the way I cook. I did follow the proportions exactly as suggested with the tiny addition of some fresh thyme, about 2 tsp. finely chopped. The herbs are exploding in the garden, so I couldn't resist! Name: Laurie | Comment: EXCELLENT! This recipe is 5 stars as written, which I find very rare! I was trying to find some way to use lentils, and this is now a staple for me. I followed the recipe exactly the first time, except I used fresh instead of dry thyme. I froze some of this and it kept well. This makes way more than 4 servings! The second time I made this I used 4 pieces of bacon (I accidentally pulled out an extra piece) and used a combo of dry and fresh thyme since I wanted to use the last of my fresh herb. I also added a second bay leaf to experiment. Neither time did I add the dollop of sour cream, but I did serve it with crusty french bread. I liked the recipe better the first time, my husband liked it better the second. You really need to try this one. Name: rpry Comment: How much total balsamic? 1.5 per 3 c soup pureed or 1.5tsp total? Name: Laurie Comment: Add the thyme and bay when you simmer it for 39 min. I have always made this recipe with only 1.5 tsp TOTAL of balsamic vinegar. I only add the balsamic into the 3 cups I blend, then return that to the soup pot. Also, I've been lazy on many occasions and just pulse my immersion blender a few times in the pot instead. Hope this helps.